↑ Marshall J. Getz (2002). 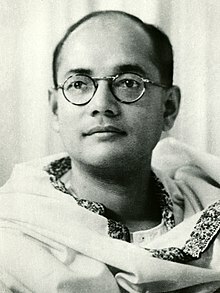 Subhas Chandra Bose: A Biography. McFarland. pp. 7–. ISBN 978-0-7864-1265-5. Retrieved 23 December 2012. ↑ ୪.୦ ୪.୧ Kanailal Basu (20 January 2010). Netaji: Rediscovered. AuthorHouse. pp. 262–. ISBN 978-1-4490-5567-7. Retrieved 23 December 2012. ↑ Yasmine Jesudasen. Voices of Freedom Movement. Sura Books. pp. 57–. ISBN 978-81-7478-555-8. Retrieved 23 December 2012. "Mystery over India freedom hero". BBC News. 2006-05-17. Retrieved 2008-08-10.